Moree Plains Shire Councillor Kerry Cassells, left, Northern Tablelands MP Adam Marshall and Moree PCYC Manager Tayla Macey last Friday. 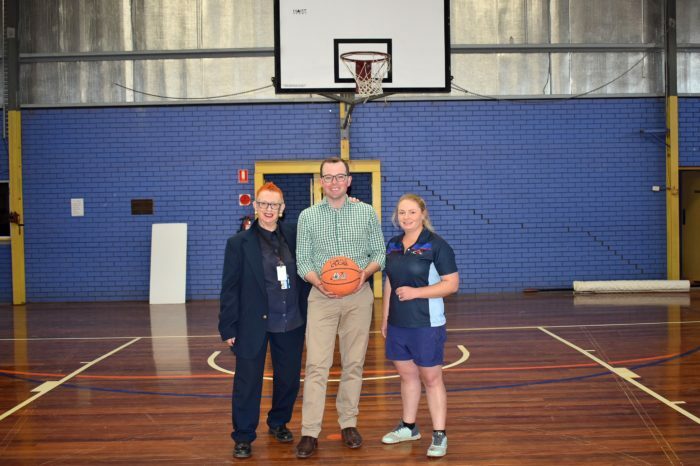 MOREE’S PCYC basketball stadium is set to get a new roof, insulation and air conditioning after the announcement of a $164,296 grant from the NSW Government by Northern Tablelands MP Adam Marshall. Mr Marshall was in Moree last Friday to announce the funding for the major upgrades to the Boston Street facility and said the boost followed a $2 million allocation in the recent 2018-19 NSW Budget for upgrades to the Moree PCYC and will complement works to be done under that project. “There’s always a push on for more people to get out and active and it’s important that we have adequate facilities to make that happen,” Mr Marshall said. “Enhancing the basketball stadium will ensure that it can be used for many different sports in Moree for many years to come. Councillor Kerry Cassells joined Mr Marshall and Moree PCYC manager Tayla Macey for the funding announcement and said the basketball revamp was vital. “The facility has been utilised for various sports and it keeps young people healthy, well and fit. At the end of the day, the facility is the prime premises for sports in Moree,” Cr Cassells said. Ms Macey said the stadium had been built in the 1980s and the newest project would fix some real issues and she paid tribute to Mr Marshall for his support to get the funding to do that. “After a day of heavy rain we actually close the facility because of the leaks in the roof,” Ms Macey said. Ms Macey said repair work would also be done to the original brick structure. “Because the PCYC is a not-for-profit we do rely on funding so we can upgrade our facilities and keep sport popular with the young kids,” she said. Mr Marshall said Moree PCYC delivered a vast array of programs to the local community. “The stadium requires modernisation and as the first stage of a greater project, the most pressing concerns are the roof and the air conditioning system,” he said. It would complement the major plans under the $2 million budget allocation, giving local youth a better and bigger space to learn more sports and with more modern equipment and facilities. He said it was knockout news for local kids – set to give them a dedicated new shed for an expanded boxing and martial arts program among a list of new upgraded amenities to the Boston Street centre. The budget funding was the largest single investment in the club since it was opened in 1981 and was a huge coup for the Moree community that would see additional activities, based on community feedback. “This is a very exciting time for the club, its supporters and users – all those ideas to improve the club over the years can now be funded to ensure its serves the community well for about 30-odd years,” Mr Marshall said. He said the investments would make a huge difference to the more than 300 young people who currently use the club.